What is unique about PCQ? The Presbyterian Church of Queensland (PCQ) is a national Presbyterian Church that holds strongly to the Bible as its rule of faith and life. As a church, we have a passion for God (Father, Son and Holy Spirit), and a passion for people. This means that in all that we do we seek to bring glory to God and to be aware of where he is leading us through his Word and Holy Spirit. It also means that we are dedicated to proclaiming the gospel of Jesus Christ to those who are lost, both here in Australia and elsewhere. In doing so, we remain firmly committed to the Reformed faith as the most consistent presentation and outworking of Biblical Christianity. How does PCQ view the Bible? We believe that the Bible is God's word. It has been fully inspired by God the Holy Spirit and contains all that people need to know for salvation and to rightly understand the world - God’s world - in which they live. 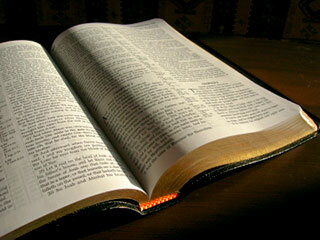 By its very nature the Bible is infallible, and forms a perfect rule for both faith and life. We believe that as God's people we need to be immersed or "marinated" in the Bible to understand how to live for God in this world. Holy Bible: The best summary of what we believe the Scriptures teach is found in the Westminster Confession of Faith, one of the several great summaries of doctrine that emerged out of the Protestant Reformation in the 16th and 17th centuries. Key elements in this Confession are the sovereignty of God in creation, providence and redemption, the centrality of the life, death and resurrection of the God-Man Jesus Christ in God’s purposes, and the necessity of the Holy Spirit in the application of all aspects of salvation. It also highlights the nature and purpose of the Church, and the need to acknowledge the Lordship of Christ in every area of life. How would you describe PCQ? The Presbyterian Church of Queensland is Presbyterian in government, Reformed in theology, and Evangelical in spirit. What does it mean to be ‘Presbyterian’? The term Presbyterian refers essentially to the way in which a church is governed. A Presbyterian Church is governed by elders according to the pattern seen in both the Old and New Testaments. This is in distinction to being ruled by bishops in a hierarchical model, or by members in a congregational model. In a Presbyterian church, biblically qualified elders are recognized through congregational election and rule the church corporately. This government is exercised locally, regionally and nationally through a graded series of courts usually known as Session, Presbytery and General Assembly. It provides a way for the whole Church to be connected in mutual accountability and responsibility, and demonstrates organizationally our common bond as the body of Christ under His Headship. What does it mean to be ‘Reformed’? Grace alone as the only way to be reconciled to God. Faith alone as the only means of receiving God’s grace. Christ alone as the only ground of God’s saving grace. Scripture alone as the only infallible authority for belief. God's glory alone as the ultimate purpose for the lives of men and women. What does it mean to be ‘Evangelical’? To be ‘Evangelical’ means to believe in the importance of sharing the good news of God’s salvation in Jesus Christ. It is to proclaim that through Jesus Christ the kingdom of God has been inaugurated, freeing people from the guilt and power of sin and death through personal faith and repentance. As a Church we express this priority by stating in our governing documents that evangelism is the first work of the church. We also show its importance through our emphasis on church planting and world missions. ©2013-2019 Presbyterian Church of Qld. All rights Reserved.